their decades-long assault on America’s institutions. Virtually every Republican candidate for Congress has denied the most rudimentary facts about climate change. 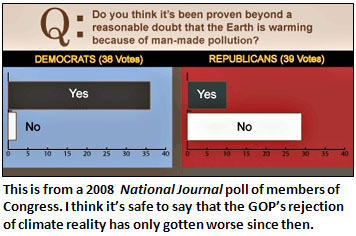 Yes, Democrats mangle climate science sometimes too. Activists can exaggerate the degree of certainty behind model projections. Scientists can be unduly dismissive of critics. Nobody is blameless. But there is simply nothing on the left (or in the center, or in professional science) remotely equivalent to the anti-intellectualism that reaches to the very top of the Republican Party. Conservatives are politicizing climate science. Curry is uncomfortable saying that; it sounds like “getting involved in politics.”….But the fact remains: Even if climate scientists confine their comments purely to what’s known with a high degree of probability, with all the uncertainties baked right in, staying scrupulously clear of policy or ethical judgments, they will still find themselves aligned against the conservative movement and they will be attacked. Republicans slander peer review, science funding, scientific institutions, and scientists themselves. “Both sides” don’t do that. Just the right side. Obviously this puts climate scientists in a difficult position. As pure scientists they may want to avoid making policy pronouncements, but they also have a legitimate interest in making sure that overreliance on nuance doesn’t swamp understanding of their basic conclusion. And their basic conclusion is that greenhouse gases are warming the globe, quite possibly in a catastrophic way. When one side in the debate considers a simple analytical judgment like that to be de facto politicization, that makes it impossible to avoid politicization no matter what you do. So what’s a scientist to do?